Millennium Park's Imagination Playground inspires creative, collaborative play. THEY LIKE TO MOVE IT Kids get busy with massive foam blocks. If your kids were talking about building a pick-up truck or medieval castle at the neighborhood play lot, you’d probably pat their heads and marvel at how they manage to conjure images of long-ago lands and super highways from tired sand boxes and swing sets. But if they were visiting Millennium Park’s Imagination Playground in a Box installation, their dreams might not seem so pie in the sky. The temporary setup, one of 33 installations at parks throughout North America, consists of about 30 “loose parts”—movable blocks made of biodegradable, heat-and germ-resistant foam, plus mats, wagons and crates that allow kids to manipulate the setting. 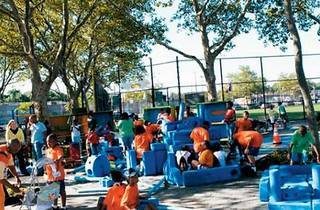 The emphasis here is on creative and collaborative free play rather than motor skills, according to David Rockwell, the renowned architect and ex-Chicagoan who created Imagination Playground with his New York–based firm Rockwell Group and nonprofit playground builder KaBOOM! Rockwell tested the over-sized, oddly shaped blocks on his own kids before introducing them to the masses.“It was great, they really liked it. They made something surprising every time: Forts, roller coasters, the stuff I loved to build as a kid.” The next step? 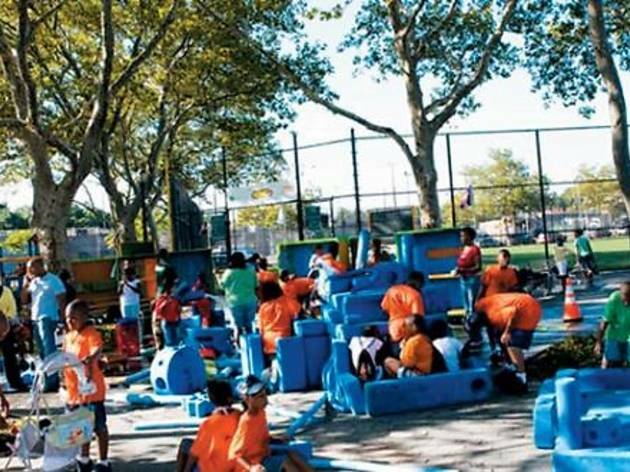 Permanent, tricked out versions of these kid-play oases—like the one that opened in South Street Seaport in New York City on July 27—complete with water, sand, and bigger, way badder blocks. Imagination Playground in a Box is open daily from 10am–3pm at the Family Fun Festival in Millennium Park Family, which runs through September 3.